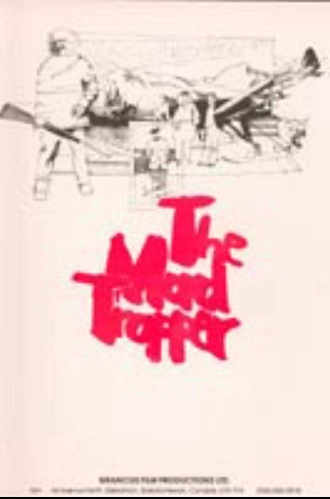 “The Mad Trapper” is a 1972 British made-for-television docudrama film. “The Mad Trapper” is based on a 1931 Royal Canadian Mounted Police (RCMP) pursuit of a trapper named Albert Johnson, the reputed "Mad Trapper of Rat River". In the Yukon, an American trapper (Del Henney) attempts to live in peace but is aware that other trappers resent his presence. When he is confronted by rival trappers, they bring along Millen (George R. Robertson), the local RCMP officer. Feeling intimidated, the trapper fights back, shooting his way out of his cabin, killing Millen and embarking on a desperate attempt to escape the authorities. The hazardous trek through the Arctic in the middle of winter becomes an epic manhunt, led by "Sarge" (Richard Alden). The RCMP eventually employ dog teams, radio and aircraft to bring down their prey.